Interesting article from Matthew Appleby about research sponsored by a leading pesticide manufacturer. Two specific enzymes, one in the honeybee and one in the bumblebee, may help find a new generation of insecticides that protect crops without threatening the pollinators. Discovery of why two of the most economically important bee species are immune to one neonicotinoid insecticide but not to others promises to yield chemical treatments that protect crops from pests without harming these essential pollinators, honeybees and bumblebees. Bee pollinators are equipped with biochemical defence systems, in the form of specific enzymes, that define their sensitivity to insecticides by enabling them to metabolise the chemicals safely, report an international team of researchers, led jointly by Rothamsted Research, the University of Exeter and Bayer AG. 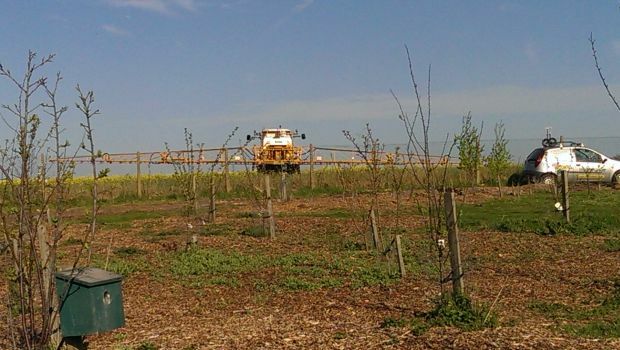 Rothamsted biointeractions and crop protection head Lin Field said: "Some neonicotinoids are highly toxic to bees but others have very low acute toxicity; in public debate, they tend to get tarred with the same brush. Each insecticide needs to be considered on its own risks and merits, not just its name." The team’s findings, published today in Current Biology, extend previous work by other researchers, who had linked immunity to rapid metabolism, by pinpointing the specific genes, and their enzymes, involved. The discovery opens up the opportunity to design bee-friendly insecticides. development to see if bees can break them down," says Chris Bass, Professor of Applied Entomology, who led the group at Exeter. "It can take a decade and $260 million (£190M) to develop a single pesticide, so this knowledge can help us avoid wasting time and money on pesticides that will turn out to be harmful to bees," notes Bass. "The knowledge from our study can also be used to predict and prevent harmful effects that result from inadvertently blocking these key defence systems." The EU introduced restrictions on the use of neonicotinoids in 2013 and, at the end of last month, the European Food Safety Authority published a review of research assessing the risks to bees that EFSA’s Pesticides Unit began in 2015. An extension to the restrictions is now being considered. "Identifying the mechanisms that contribute to inherent tolerance helps us, and regulators, to better understand why certain insecticides have a high margin of safety in bees," says Ralf Nauen, an insect toxicologist, who led the group at Bayer. The three main neonicotinoids are imidacloprid, thiamethoxam and thiacloprid: the first two contain derivatives of nitroguanidine, an organic compound, and can be as toxic to bees as they are to the pests they target. The third contain derivatives of cyanoamidine, another organic compound, which honeybees can digest. Bumblebees show similar responses. The research team pinpointed one subfamily of enzymes in bees, CYP9Q, which are part of the enzyme group known as cytochrome P450s that are also responsible for breaking down toxins in humans, as the key to the insect’s immunity: CYP9Q3 in honeybees and CYPQ4 in bumblebees. "This knowledge," they report, "can be leveraged to safeguard bee health." This research programme received funding from Bayer AG, a manufacturer of neonicotinoid insecticides. The work at Rothamsted comes under one of the institute’s five strategic programmes (2017-2022), Smart Crop Protection, which is supported through the Industrial Strategy Challenge Fund of the Biotechnology and Biological Sciences Research Council. Rothamsted is also supported by the Lawes Agricultural Trust.